Horse Carabiner Keychains Custom Engraved at Wholesale-Carabiners.com! Say Giddyup to your marketing or message with our custom engraved horse carabiner with your logo, ready in 3 days! 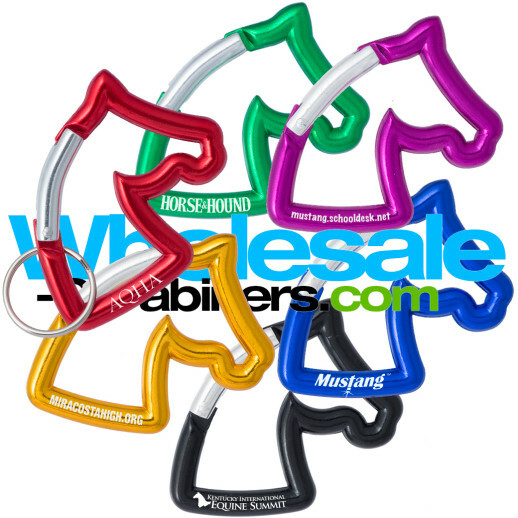 Our horse head shaped custom carabiner comes with laser engraving included in the low price, and features a sleek, rugged and bright anodized aluminum finish. Precision molded, providing the detail, precise curves and shapes that only true molding can deliver. Wholesale priced for horse lovers everywhere!